Well, it has been a little while since our last post, but that means we have been busy and having fun! The weather has been very warm lately, so we spent a lot of time in the "Freibad". This is a big park with swimming areas, laying areas and a place to eat. Here are the two we visited this week: hirzibad and Weyermannshaus. I was very proud of Eva for going down the big water slide at the first one! This week for schooling, we learned all about insects. We built a homemade ant farm, observed bees in gardens and discussed insect anatomy. Eva learned about how bees help to pollinate flowers. We made a lapbook focusing on bees, ants and butterflies. We did some fun insect crafts (see below), and watched some youtube videos about bees and ants. We also explored a new library in our area that has a "Ludothek". This is basically a place where you can rent toys and games. Eva chose a micro scooter, a puppet, and two board games. Every few weeks we will go back to exchange for new things. They have all toys a kid could want, from playmobil and legos, to stilts and bikes. We will definitely be taking advantage! Here is Emma attempting to stay cool during her nap. Eva trying out her cool scooter she rented from the library. Here are the supplies for our homemade ant farm. You need sand or dirt, two soda bottles in different sizes, some paper, a paper towel, rubber band, cotton ball, tape, needle, and ants! The how-to guide can be found here. I love how the guy makes placing the ants in the farm sound so simple. Out of all 30 or so ants we caught, I think 5 made it into our farm and the other 25 ran up my sleeves and over the balcony. Much shrieking ensued during the ant installation. Below is a video of our ants in action! This is what I was greeted with first thing on Monday morning. Eva was shouting "Insect Week", and made herself an impromptu pair of antennae. Here are some flowers where we observed the bees. Can you see any in this photo? Here is a cute crafted dragonfly made of a clothespin and 2 popsicle sticks. Here, Eva is painting a flower pot to make a cute bee craft. Ta-da! The bee craft out of a flower pot. Eva was very proud of her straight lines! We looked at Was kriecht und krabbelt da, Die Biene, Bienen, Licht an! : Licht an! In den Nestern der Insekten, and the Eric Carle The Very Collection. I made a felt board and pieces to go along with the Very Hungry Caterpillar story. I love the Licht an series: They always come with a little "flashlight" and the pages are dark until you shine the flashlight on them. In this case, you can use it to see into insect nests. It is a very cute idea! By the way, most books we use are from the library, a great FREE resource! The books for this unit. 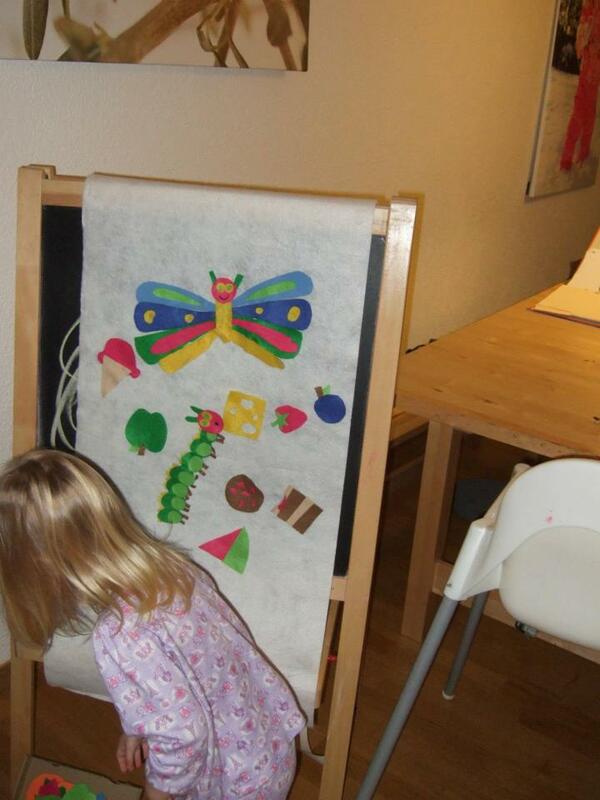 Here is Eva working with the Felt Board story pieces I made. She can just drape it over her easel when she wants to play with it. another great episode added to your blog! I love it, it covers so many areas of activities, nature, biology, sports, etc. I passed details of the "ant farm" on to Tobias. He and Anna will probably start their own ant farm. Eva is great with the scooter, and Emma is getting chubbier and more "talkative" each week. Lovely to watch. I look forward to the next instalment.